Training is all about preparing for race day but it also means adjusting life to support the training. The short answer: a lifestyle change. Change, adjustment, choice–call it what you will but half Ironman training is a significant commitment and one that requires dedication and focus. I’m starting week 9 of my 20 week training plan and somehow only just recently realized that my decision to train for 70.3 miles is truly no joke. This is serious stuff and one that really has been a lifestyle change. This realization came to me on a Friday night when I was happily getting ready for bed at 9:30 p.m. The training plan I’ve been following is posted on TriFuel and is geared toward intermediate athletes. The author is a professional triathlete, Matt Lieto, and he includes important plan assumptions that I took seriously when I selected his plan but that recently started to hit home. For example, the plan is based on 12-15 hours of training per week. 12-15 hours is a lot of time to be swimming, biking, and running. By the halfway point in the schedule there are two days of double work-outs and one brick session as part of the plan. Monday is a rest day so the work-outs are done on the remaining six days of the week. I prefer morning work-outs but on the double days I need mornings and evenings to get everything done. This means I am usually starting my day around 5 a.m. and ideally going to bed by 9:30 p.m. When I’m not working out, I’m working. And eating. What I’ve discovered is that half Ironman training is much more than steadily increasing swims, bikes, and runs. It requires a support system (shout-out to my awesome husband, family, and friends for this! ), healthy snacks, lots of protein, lots of water, and good sleep. It requires cutting out alcohol and sugar and making hard decisions like going for a run instead of to happy hour on a Friday night. Training plans will be different for every athlete and there are tons of plans, coaches, books, and resources out there to help you form a plan that will best suit your schedule as well as your selected event. (Please feel free to share what you use/do in the comments.) Regardless of the plan you choose, one important factor is having a base built before you start training. In my case, I signed up for the Amica Ironman 70.3 in November. I then researched training plans and settled on the 20 week schedule which had me starting at the end of February. From there I backed out the base building I would do. I’d just finished the Richmond Marathon and knowing that my running was in good shape I shifted focus to swimming, biking, and strength training and kept short runs in my work-outs as well. I maintained a light base building schedule for two months prior to starting ‘official’ training. I’ve found that the plan I selected works for me most of the time. There are weeks where I have to shift work-outs to fit my schedule and in some cases I focus more on distance than on time. For example, the runs are scheduled according to time but I prefer to build distance and aim to reduce the time it takes to cover the mileage. My hope is that I can keep 9 minute miles during the run portion of the event but I’m training at an 8:30 pace so that mentally I know I can go faster. I also signed up for a half marathon a month before the 70.3 so that I will have a benchmark for my race pace. Video taken during March Madness weekend; very helpful for understanding what to work on. With regard to swimming, the plan suggests lots of intervals and drills versus straight yardage which makes sense to me. At this point I’ve only done 1000 yards straight just to see how I felt. The rest of my swims are a variety of routines that I made up and that vary from 300-600 yards in intervals. I know I should be doing more stroke and kick drills but in honesty I only do about 100-200 yards of drills each time. However, I always focus on my stroke and on improving overall efficiency and I believe that is proving effective. Soon, open water swims will be a regular part of the routine and I look forward to seeing how my work in the pool translates to open water (and to swimming with a wetsuit). In addition to getting through the work-outs, I believe diet is my next big focus of triathlon training, and gear is probably next in line. The most I can say about theses two things right now is that I’m still trying to figure it out. I am hungry all of the time. It seems as though I eat all day long and while I am trying hard to make sure I’m eating protein, healthy fats, and lots of vegetables and fruits, I know that I could stand to brush up on nutrition and find a better balanced diet. And once I have more knowledge of all this, you can be sure I’ll post what I learn. 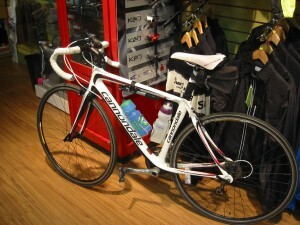 My trusty Cannondale that I plan to soon equip with aero bars. Triathlon gear is its own category as well. I spend a lot of time on bike rides thinking about race day gear and transitions. I have limited tri gear right now and my goal is to ask other triathletes lots of questions, read lots of information and reviews, and really think through what my best gear options will be. Then I’ll make the investment. So if you have any opinions on tri tops, tri shoes, aero bars, and fuel (Hammer, Gu, Clif, etc) do share! Training for this 70.3 is indeed an experience. It is a personal challenge and I am soaking up as much of it as I can, learning as much as I can, training as hard as I can. Because on race day, it is all about what I did to prepare. 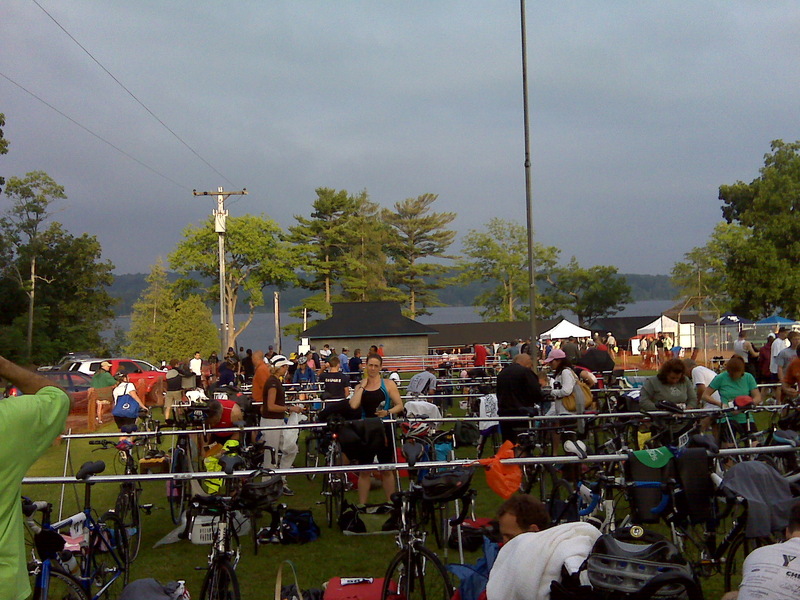 This entry was posted in Articles, Triathlon and tagged 70.3, biking, half ironman, Running, swimming, Training, Triathlon on April 26, 2010 by Natalie. wowzers !!! good for you. i know a few ladies who are training for their first half. i am training for sprints and i find that time consuming so i can’t even gander what it would be like for a half. a lady i train with is training for her 6th FULL ironman ??? Thanks!! I cannot imagine training for one full IM let alone 6, good for your friend! Good luck with your sprints…training for anything is work and knowing that you have kids makes it that much more impressive to figure out how to balance it all. Thanks for checking out the post! This is great – I took am starting my 1st 1/2 Ironman training program but not sure I’m sharing that with anyone except my trainer and myself. My head is spinning just trying to make the decision (I’m 40 with 2 kids). Figure I’ll give it a go for a few weeks, understand my committment and then share with some close friends. It was nice to read that you have the same questions and concerns I do. I look forward to checking in on you! Sandi–Congrats on getting going! What race are you training for? I admire the independence you’re tackling the training with but I highly suggest you share it with friends, family, and anyone else who can serve as a support team for you. I rely heavily on my husband for simple things like making dinner because after work and training there is literally not enough time to cook. I think the training–and the event–is definitely doable but it is an enormous commitment of time; and as I note, a lifestyle change. Good luck with everything and have fun! I woke of this morning and decided that I will do a Half Ironman, so I googled for some training plans an came accross your page. I like it! Have you come across any useful books to help with your training? Congratulations Jen on your decision! It’s one of the most amazing accomplishments I can say I’ve ever had. I’m remiss in writing my recap and many other posts that hopefully will have plenty more helpful information in them. I know there are great books out there but I relied on blogs of fellow athletes, tweets, and members of my local triathlon club for training guidance and advice. Good luck!! Just found your blog and I have a lot of questions, some of which I am probably not aware of yet. 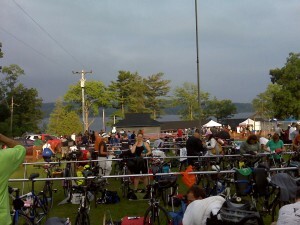 I have just decided to aim for the Rev3 70.3 in Knoxville, Tn, on May 15 2011. I have only done two half marathons and two sprint triathlons. I am currently training for Huntsville (Alabama) marathon in December. I say all of that to say, I am going way over my head? I live in middle Tn, so I know winter biking is going to be cold!!! Darren, Thanks for checking out the blog and congrats on signing up for your first 70.3! You are definitely not in over your head. The marathon training will give you a really good sense of the endurance you are able to achieve and is good prep for the time you’ll need to dedicate to 70.3 training. Re; winter biking. Given that your race is in May, the bulk of your biking can hopefully be during warmer temps; let yourself wait until the afternoon on weekends for your long rides so it will be a bit warmer. Definitely get covers for your bike shoes, cold toes are no fun! You will surely have more questions along the way and some you’ll answer on your own as you train but there are lots of great blogs and Twitter athletes who can help guide you. Good luck! How did you select your tri group (or was there only one)? We have many groups in the Denver area and I am struggling to find the one that will help me most. My biking is the weakest link. Well done to all of you who have decided to race in a 70.3. I have done my first one this year (Rapperswil in Switzerland), and I know all the commitment this requires. Family and friends are indeed very important, not only for the logistic side of things (making dinner, taking care of kids during training etc…), but to me it was mostly the case to keep the motivation up. When you follow a 5-6 months training plan, there is always a moment when the motivation goes down, and when you ask yourself “why the hell am I doing this to myself!”. Then, someone comes to you and asks how it’s going, tells how much what you’re doing is impressive, and that puts the motivation back to its top. Also, you become an example for most people. I know at least 4 people who started to run while looking at me putting these 15 hours of training a week. That helps a lot. As to reply to Darren, I’ve been through the same last year. February-March in Switzerland is windy, freezing (-15° C), and you often wonder what you’re doing with your bike outside struggling against weather conditions, and obviously against yourself. To me, more that the physical training training I was going through, the mental training was the most important. Tell yourself that if you can go through this, you’ll make it through the 70.3, whatever happens on that day. You will just be mentally strong enough to get to the finish line. Mental is in my opinion at least as important than physical training if you just aim at finishing your first 70.3. Also, separate single-discipline races are to me only good for one thing: The racing ambiance. Racing a marathon won’t help you to go through your marathon. It will help you not being scared at the beginning, it will help you knowing you can run the distance, but they are 2 completely different races, you don’t run the same in a 70.3 than in a marathon. Last but not least, to all those who doubt, keep going, keep focus, keep moving whatever happens. It is worth it, even if very difficult. Once the finish line past, you will want to kill the next person who next talks to you about sport or training, seriously. One thing you’ll want is rest and sleep. I just finished my first olympic. it was great. not too much training. only getting those long bike rides/runs were difficult for me time wise. i’m not a morning person… so 5am was no option but my goal is a 70.3 next year and i know i’m going to have to get over the early morning. unfortunately im a night owl though so the first few weeks may be difficult getting into the swing but i’ll probably be so exhausted it wont be tough to get in a routine. Great comments, thank you for sharing! I couldn’t agree with you more about the importance of being mentally prepared. That takes almost as much training as does the running, swimming and biking. I also agree that doing other single-event races will help you prepare for the race environment and in many ways you can use those races as part of your training but a 70.3 is much different than a single-event race. Keep the comments coming and please continue to share your own experiences! I just signed up for my first after 3 years of sprints and olimpycs. Don’t know. The intention was not to go for 12 hours training. It sounds like you have a good amount of sprint and Olympic distance races under your belt and while that will give you a good foundation, you will still need a pretty intense amount of training to complete the 70.3 miles without getting hurt. The training program I did ranged from 10-15 hours per week…it is a big commitment and often involves two work-outs a day. You may be able to avoid the morning and evening sessions by doing one longer session but you will still need to try and find the time to make sure you’re training for the distance, strength and endurance necessary for 70.3 miles. When and where is your race? Good luck! I have only done race in my life of any kind. Last year i did a sprint at age 59, before that not even a 5 k. I am now training for a half marathon. Swim and bike are not an issue. If I make the half in the spring I will then do a 70.3 in the fall. It will take everything I have! Hi, I just found your blog. I am in week three of a 20 week training program for a 70.3 in July. So far so good! I have done a bunch of sprint tris and one Olympic tri. I have run many half marathons but this is a whole new chalkenge!! I have a 2 year old and a 4 year old so my main challenge is working out and keeping up with them:) my husband is very supportive which is so important, but I have a feeling be will be glad when this is over. I will probably do two workouts a day once the workouts increase but for now I can fit them in a 2 hour or less chunk (which is how long my kids can be in the gym childcare) I joined an adult swim team in town and there is a tri team within the swim team. Also alot of people I do spinning classes with do triathlons so I hope to ride with them as the weather warms up. Thanks for sharing your experience, I am off to eat of course! I have six more weeks in my training left until my first 70.3. May 15th is the BIG DAY! My friend picked out the training plan and little did I know or even look that it was an Advance plan. Thought I was loosing my mind by week six. I’m a single Mom with a 14yr old. I’ve been a BIG runner and had been dreaming and working up to this for four yrs. now. He just told me last week that he didn’t realize it was Advance. I’ve gotten to the point I JUST WANT TO DO THE RACE and feel ready. Did you get to that point ever? I’m pooped….. The bricks on the weekend and then a 31/2hr bike on Sundays are a ton of hrs to log all the time. How did your race go and your training plan? Shawn, congrats on your first 70.3! You are at a great point. I felt the exact same way and I think it’s a good indicator that you are mentally ready to get through the distance and as tiring as powering through the last weeks of training will be they will give you that last little bit of confidence and endurance you need for race day. My race was fantastic (and my recap of it is looooong overdue) and the training plan prepared me just the way I needed. In hindsight, I would’ve liked to have done more speedwork on the bike, perhaps a few more bike/run bricks and I would’ve liked to have spent more time on strength and figuring out fuel. All that being said, I was very happy with my race and time (6:04) and would definitely do it all again. Hi, great blog!.. and great to read so many other peoples comments, questions, advice and concerns! I’ve signed up for Beach2Battleship 70.3 in late October and start my 20 week plan early June. Never done a tri before of any kind and planning to do a sprint and an Olympic as part of training plan..No previous excellence in any of the sports, just have a desire to ONE day do a full Ironman and this is a path to it.. Bloody Bucket Lists! .. One of my big worries is motivation for those times when it is lacking.. any advice from anyone on where to recieve the inspration from? I have a nice big pic of a 70.3 finish line above my desk but hoping for some folks thoughts..
Donnie, very impressive that you are tackling your first 70.3 essentially site unseen! I’m glad you’re going to get some shorter races in this summer. Make sure you practice using all the exact same gear you’ll use in October. And get some Body Glide! How to stay motivated? Keep reading blogs, follow other triathletes on Twitter and keep looking at that poster. Visualizing the big race will help motivate you to get through the training and remind you why you’re doing this. It is totally worth it. Good luck and have fun! Great job! I’m thinking about about doing a half iron man by the end of the year or early 2013. I’ve done two sprint Tri’s and this Sunday I’m running my first half marathon in Huntington Beach. Your story has really motivatived me. I can use all the tips I can get. Good luck!!! Danny, good luck at your first 13.1, you will do great and my guess is that run will inspire you even more. Happy training! I have signed up for the Door County 70.3 on July 22. My main concern is the bike, too. I take three spin classes a week and ride my trainer on the weekends indoors, but I won’t be out on the real road until the snow melts. I also have a sesamoid problem on my left foot, so the running has been slower. I’m a distance swimmer, so that’s ok for me. I just want to make sure I have enough left in me to get through the run. I guess I’m just excited to see the finish line!